Ladies and Gents, I’m thrilled to be conducting my first author interview with Emily Murdoch. I am lucky to call this great woman a friend, and honored to be her beta reader. Ms. Murdoch’s first novel, If You Find Me (formerly: The Patron Saint of Beans) will be published on April 2, 2013 by St Martin’s Griffin. It has also sold overseas to Germany and the Netherlands. More overseas sales are in the works. A portion of the proceeds will benefit Taylor Hendrix’s Christmas Project. Seventeen-year-old Taylor, battling osteosarcoma, gathers gifts in backpacks to brighten the spirits of cancer teens in hospital during the Christmas holidays. Also, Ms. Murdoch will be giving away a free, signed ARC. Entrants for the drawing only have to tweet this post link and mention so in the comments. The winner of the free advanced reader copy will be selected by random drawing in one week. Now, without further ado, let’s hear from Ms. Murdoch, herself. 1. 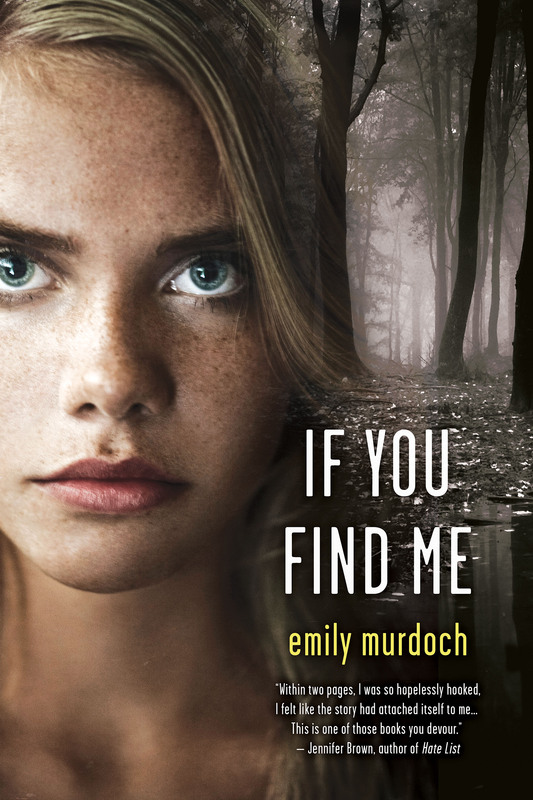 If You Find Me is a realistic YA novel with adult crossover appeal. Could you please tell my blog readers a little about it? A broken-down camper at the Obed Scenic and Wild River National Park – dubbed the Hundred Acre Wood – is the only home fifteen-year-old Carey has ever known. Sure, coping with a bipolar mother on meth is no picnic, but beneath the sun-dazzled canopies of Hickory and Walnut, Carey’s violin transports her from their bare-bones existence in the same way her little sister, Jenessa, finds comfort in her stash of second-hand Pooh books. Life is dependable that way, until Mama goes into town for supplies and vanishes off the face of Tennessee, sending social services in her wake with a one-way ticket back to their father – a stranger in an even stranger world. 2. What inspired you, or drew you to writing this novel? I happened to watch two news magazine stories back-to-back on parental abduction and alienation, one being the story of Sean Goldman, abducted by his mother at age four and taken to Brazil, leading to an international custody battle. I remember aching for his father, David, left behind in America and fighting to get his son back. He did — five years later — but neither of them would ever be able to recapture the time they’d lost. The level of betrayal, in my mind, was stunning. Not to mention the constant worry about that child’s welfare, and how it couldn’t help but impact *everything*. Life freezes; time stops, or, in the case of the children, resumes, built on lies and deceit. I couldn’t shake the stories from my mind or heart. 3. How would you describe the main character, Carey? Strong, resilient, loving, earnest. Fiercely protective of her younger sister, Jenessa … while also flawed, damaged, confused. What I love about Carey is how she knows when to fight, and when to let life just wash over her, like a pebble in a stream. She’s determined to find light in the darkness, and always holds on to the hope that her life will get better. 4. Readers sometimes mistake characters, especially those written in first person, with the author. How does Carey differ from you? And in what ways are you similar? Great question, and so true! I was not abducted as a child, nor did I grow up in the woods. But I did experience a tougher childhood than some, and spent a lifetime overcoming my experiences. Like Carey, I always searched for the light in the darkness. I always believed that the hard times contained lessons meant to stretch us, to grow our hearts, to teach us things we could pass on to those who needed them the most — those people in the places we used to be. 5. Did Carey come to you fully-formed, or did she emerge slowly throughout the writing of the novel? Without spoilers, in what ways did she end up surprising you? I guess you could say she did come to me fully formed. I’d liken it to a sculptor finding the image in the blob of clay, or chunk of marble. Wasn’t it there already, just waiting to be found? Carey surprised me, by being that pebble in the stream. By not running away. At one point I thought she would. She decided otherwise. 6. If you could cast anyone as Carey (current actress or from days past, who would it be? I think Dakota Fanning would make a wonderful Carey. She has the talent and emotional depth to bring all facets of Carey to life, including the said and unsaid. She’s an amazing actress; truly gifted. I knew since first seeing her in Taken and I Am Sam that she had God-given talent. 7. Did Carey or the story come to you first? Carey. I knew she was a fighter with emotional depth and a wealth of wisdom learned the hard way. Right from the start, I admired her heart and the fight in her and felt she chose me to tell her story. 8. Now let’s chat more about you and writing in general. The writing process is fascinating, and I’m sure many would love to know about how you go about it. First, are you a plotter or a pantser? Pantser all the way! When I begin a novel, even I don’t know the full story or what’s going to happen. I find it out just like my readers will — paragraph by paragraph, page by page. 9. When did you first begin writing, and when did you begin serious attempts at being published? Could you tell us about your journey? I wrote short stories and poetry from Kindergarten on. I was obsessed with books, both reading and owning them, and loved those tiny little books you used to get in bubble gum machines as prizes. I even used to cut construction paper into small pages, staple the middle, and make my own “books”. I wrote my first real book (all 265 passionate pages!) at eleven-years-old. I used loose notebook pages held together with a binder clip. One afternoon in sixth grade, I left the manuscript behind in the school library. Our librarian, Mrs. Mills, found it and read it in full. The next morning, I made a mad dash to the library, hoping it was still there, and she held it up, raving. “Would you mind if I typed it up and sent it to a few publishers?” I remember nodding my consent, because I was speechless! Flash forward to now, and I’ve written five manuscripts. If You Find Me was my third queried manuscript. I do believe I’m here today because of all the effort that went before. However, I began writing with an eye toward publication in May of 2008. 10. What authors inspired your dreams of being a writer? Favorite books? The answer is those favorite books: Anne of Green Gables by LM Montgomery; Little Women by Louisa May Alcott; any novel by Frances Hodgson Burnett, but especially A Little Princess and The Secret Garden; The Diddakoi by Rumer Godden; and A Wrinkle in Time By Madeleine L’Engle. 11. Besides other books, what feeds your creative muse? It’s always art; books, movies, paintings. I like to be moved, and I aspire to move others through my writing. We live in a fast society, often steely and hard. Anything that brings us back to our hearts, is golden. 12. Do you prefer writing in long spurts or during short periods throughout the day? Are your creative juices better at certain hours? I like to write at night, but I write throughout the day, also, whenever I can, and whether I feel like it or not. I sit down and enter a state of “flow”, where hours fly by, I forget my physical self, and the words stream through me, oftentimes faster than I can type. I’ve always had a knack for this almost dissociative state I can’t quite explain, even to myself. I feel like a conduit for the stories. All I have to do is sit down, let go, and believe. 13. Do you listen to music whilst writing? If so, what was this novel’s soundtrack? Do your characters have different theme songs? I always listen to music. I either listen to zen or classical. I write better with music, but it has to be music without words, and something that loops in the background. For me, that is our satellite television’s classical and zen/new age music channels. I wouldn’t be surprised to get a call from the company one day telling me it’s on so much, I broke their stations! 14. Do you have any writing rituals to help you get into the mood? When I was younger, I would’ve said I wrote best by candlelight or by the fireplace. I wrote in notebooks, with a specific pen, (still the pen I prefer — Pilot Precise V5 rolling ball, extra fine point, black ink) and always with coffee nearby. While some of those things could still be true, (the candlelight, to get my Louisa May Alcott on, the certain pen and the coffee, although now I write on my laptop) the whimsy of having writing rituals has taken a back seat to the reality of writing, especially for publication, where deadlines and paychecks are involved. 15. Do you visualize the story as you write it, or do you hear it? Wow. I never thought about that. I’d say both. When writing in scene-mode, I visualize the scene. When writing dialogue, I hear it. 16. While you are writing, would you compare yourself to a Method actor who uses their own experiences and emotions to become the characters, or are you more akin to the external and objective methods of a classically trained actor? God you’re good! Awesome questions! Since I write in flow, it’s almost like I’m taking dictation, of sorts. However, when I read back over material I wrote and it makes *me* cry, that’s when I know I nailed it. 17. The process of getting a novel published can be a very long one filled with incredible ups and downs. What helped you stay grounded throughout? YOU! Huge hugs! And all my writing friends. Without people who really, REALLY understand, I’d be in a straightjacket — and everyone knows how impossible it is to type in a straightjacket! 18. Favorite quote from another author? 19. What is your life motto? It’s the seed of all that could be. 20. What stories are in the works for you? I’m currently finishing up revisions for my next novel, D22go (dah-go). I’m a week or two away from turning it in, and hopefully it will become my option book, and next crossover novel! Thank you, Tasha, for hosting my cover reveal, for being such an amazing friend, beta reader and supporter. One day soon I’ll be hosting your cover reveal. I can’t wait! Until then, I’ll just keep counting my blessings, with you being one of the biggest ones! awww…thanks so much, Sputs! So glad you enjoyed the interview. And I know Emily will be touched by your words. And you’re right. She is SO talented! Best of luck to Ms. Murdoch with the book. It sounds like a fascinating story. Thanks so much for your kind words. She is incredibly talented and such a great person. Am so happy for her! Hi Tasha, I would like to tweet this post for you to win but I don’t see a twitter button for me too do so:( I will look for my twitter log on information to do it old school. I would like to say great interview and nice answers. It was interested to have read that she still like to write with a pen and not just type away on a keyboard. Also the sound of music in the background without words I totally understand. I too, just writing my little blog ,have to have some type of music in the background if I am writing from the heart/life lesson. You hit a note and made me smile when you ask her how do she separate herself from the character when using “I”. Because many people would relate her as if it was her own story being told. I had to smile because those percentage of the people I am one of them. I would pick it up as if it was her story being told. Also an interested way how she combined the misfortunes of what she saw in the news and place a brilliant story together. I could go on but will end it with great job both of you! Ms. Emily Murdoch wishing you success and great cover by the way. Thanks so much for the sweet comments. Emily will really appreciate it. Oh wow, really!? I twitter it yesterday after commenting. I looked up password that I used. Too cool but if it is a sign book I am going to have to mail it to you than you could summarize it for me:D Love the way you summarize and grab ones attention. This book sounds really good. I posted about it on my blog. Aww, thank you Tasha, and the always awesome Sputs, and everyone for your comments, interest, enthusiasm and kind words! Good luck to all who entered! ARCs are expected in August. We’re tweaking back cover copy as I speak. What a great interview! I particularly enjoyed the story about Mrs Mills the librarian. And thank you for the title, The Diddakoi. I loved that book and have been looking for it, but forgot the title. Best of luck with your release!